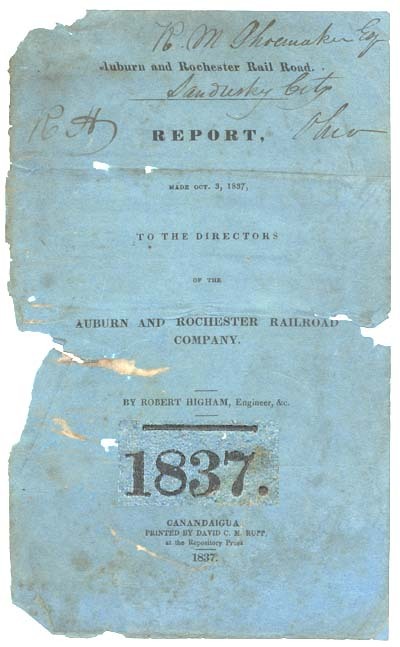 The Auburn and Rochester Railroad Company was incorporated May 13, 1836, by Chapter 349 of the laws of that year. [Henry B. Gibson's brother-in-law, Colonel Samuel Young, was in the New York Senate, and was one of the Erie Canal Commissioners. Col. Young had previously been Speaker of the House for the New York Assembly, and had failed in his run for Governor in 1824.] In one respect at least, its charter differed from most other special acts of incorporation. The usual practice was to designate the cities or villages in which the termini of the road were to be located and allow the directors of the Company to determine the precise location of those termini and also the most eligible route between them. In the case of this road, the act provided that it should be constructed between the village of Auburn and the city of Rochester, "commencing in the village of Auburn at the termination of the Auburn and Syracuse Railroad and running thence through the village of Seneca Falls and the town of Waterloo; the village of Geneva and the village of Vienna and the town of Manchester; the village of Canandaigua and thence through the town of Victor by the most eligible route to the city of Rochester where it may terminate at and connect with the Tonawanda railroad." It is quite certain that prior to the passage of the act no preliminary surveys had been made and hence this location was fixed upon with no precise knowledge of the cuts and fills and curves necesary to be made other than such as might be afforded by a general familiarity with the contour of the country to be traversed. The naming of the principal towns and villages in the country between Auburn and Rochester as places to be reached indicates that the project was largely a local enterprise, designed to benefit the localities named and to ensure financial participation by the men of means of those towns. The terminus of the road in Rochester was fixed by the directors just west of the Genesee river and at Mill street where the original passenger station was built and maintained for many years. This was not the terminus of the Tonawanda which was situate further to the west. That road was in operation before the Auburn road was located and why the latter did not avail itself of its right to connect with it was probably some local difficulty for which no explanation has been found. The gap between the two roads remained until after the passage March 19, 1844, of Chap. 50 of the laws of that year which authorized the Tonawanda to connect with the Auburn road at its termination upon such route as three commissioners named in the act, none of whom was a resident of Rochester, should determine and direct. Section 5 of this act may hint that some controversy with the city had hitherto prevented the joining of the two roads, it providing, "The Common Council of the city of Rochester shall have no power to change or alter the route or grade of any railroad track which may be constructed under the provisions of this act, or to prohibit the using of the same when made, or to prohibit the reasonable and proper use of railroad cars upon the same." So drastic and unusual a provision is unlikely to have been inserted in the act without a background of past experience. The charter contained a rather curiously drawn provision with reference to the ever present canal problem. The right was conferred to transport property as well as passengers, but there was a limiting provision in the following words; "but the corporation hereby created shall not take and transport merchandise in such a manner as to lessen the income on the Erie Canal during the time when the canal is navigable." No penalty is fixed for a violation nor does the act provide any machinery to enforce the inhibition. Just what act would have been a violation and in what form of procedure and in what court the state could have enforced the act would have made a very pretty question in its day. But this was all changed by the tolls law of 1844 elsewhere discussed. Passenger fare per mile for one person and ordinary baggage was restricted to three cents, but sufficient pressure was brought upon the legislature of 1837 to induce it to change that rate to a maximum of four cents (Chap. 11). The reason for this was most likely the impossibility of enlisting the aid of sufficient capital with the three cent limitation, other roads being granted better terms. The capital stock was fixed at two million dollars to consist of twenty thousand shares of one hundred dollars par value and it was provided that this must all be subscribed and ten per cent upon each subscription paid to commissioners named in the act prior to organization and election of directors. Subscription books were opened August 2, 1836, and at various other dates prior to December 31st, but it was found impossible to obtain the required amount. Accordingly early in January, 1837, application was made to the legislature for relief and this resulted in an act (Chap. 11 passed January 26th), authorizing the election of directors and the completion of the organization whenever there should have been subscribed $1,025,000. This sum, the supporters of the enterprise claimed, would be sufficient to construct the road, which claim was based upon a rather superficial reconnaissance and no detailed estimates of grading costs so far as can be learned. Perhaps a potent reason for fixing the amount at the sum named was found in its identity with the subscriptions already obtained. Fortunately the stock book of the Company has been preserved and a study and analysis of the subscription confirms what the location of the road by the charter indicates, that the enterprise was inaugurated and pushed by the villages and towns along the line. At the time of the organization and election of 13 directors in March, 1837, there were five hundred and forty-one subscribers to the stock. The residence of three hundred of these is shown of whom only ten were from Auburn and sixteen from Rochester. Auburn was at that time having its troubles with taking care of its road to Syracuse during the panic of 1837 and a great part of its subscriptions was later forfeited for non-payment of installments. The subscribers had difficulty enough to meet installments on the road to Syracuse as may be seen in the account of that road. Canandaigua was the moving spirit. It headed the list with eighty-five subscribers for nineteen hundred twenty-one shares. Seneca Falls followed with sixty-two subscribers and eight hundred thirteen shares; Victor with thirty-four subscribers and two hundred sixty-three shares; Geneva with thirty-three subscribers and nine hundred thirty shares; Manchester with ten subscribers and one hundred twenty-eight shares; Phelps with seven and sicty-five shares and some seventeen other villages and towns with lesser amounts. New York City was represented by twenty shares taken by one subscriber, John T. Ferguson. The main office was located and maintained at Canandaigua and it would seem that James D. Bemis [editor and proprietor of the Ontario Repository newspaper] of that place was president for a time and Henry Dwight [founder of the Bank of Geneva], treasurer, but quite early, Henry B. Gibson, cashier of the Ontario Bank was elected president, and Charles Seymour, secretary and treasurer. These two Canandaiguan men held these positions during the remaining corporate life of the road and seem to have been the controlling minds. 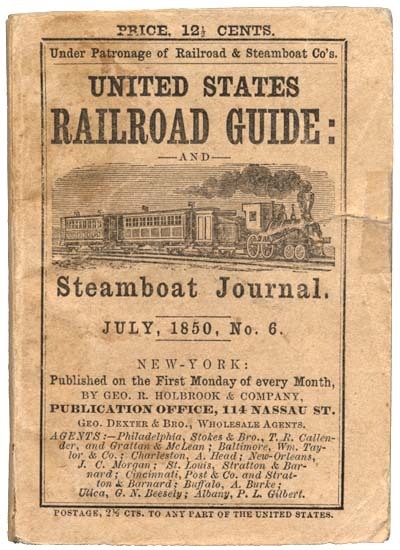 When the Company was consolidated in 1850 into the Rochester and Syracuse, they were chosen to like positions in that Company and held them until that Company was in turn merged into the New York Central. The minute book of the directors has not been found. Minute books being the primary source of information regarding the history of a road, it becomes impossible to follow in detail without them much of the early and interesting transactions. It is not possible to state the names of th first directors, but it is known they organized in March, 1837, and soon after selected Robert Higham as engineer and commissioner. 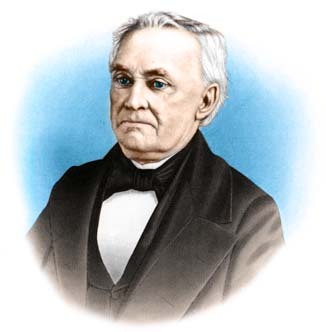 Higham had been a resident engineer on the Utica and Schenectady and when his service there was terminated by the opening of the road in August, 1836, the directors passed a resolution highly appreciative of his skill and faithfulness. He constructed the Auburn and Rochester and was for some years its superintendent, and went from this road to the Hudson River railroad. His first duty was to locate the route. He pushed his surveys during the spring and summer and October 3rd submitted to the Board a preliminary report of his operations, much of which is well worth inserting at this place, revealing as it does, the point of view of an engineer of practical experience and recognized ability. We shall be able to pass the whole distance, between Auburn and Rochester, without having any grade to exceed twenty-eight feet ascent or descent, per mile, and that without any very deep cuttings on the summits, or high embankments in the valleys. The curves generally will be of a large radius only one being as low as 1000 feet. The work throughout, will be of a plain and easy character, without any heavy rock excavation, or expensive river walling, and with as little perishable structure as perhaps any Road of the same extent in the United States. The superstructure of bridges over the Erie and Seneca canals, the Seneca and Genesee rivers, and some others of minor importance, (the cost of the whole amounting to $19,190) in fact, constituting the only perishable part of the road; and allowing that this will require an expenditure equal to ten per cent per annum, on its cost, to renew and keep it in repair, will amount to $1,919 -- a mere nominal sum for repairs, on so great a work. This permanency in the character of the work, will unquestionably be a consideration of great importance, with those who wish to have their money invested in stocks that will yield them an annual return of profits instead of having it consumed in continual repairs. The grading for that portion of the route which lies between the village of Auburn and Seneca Falls, is through gravel and clay soils; for hte remainder of the distance it is generally through loam, sand and gravel, and at three several points some slight lime-rock cuttings, but not more than will furnish the necessary quantity of stone to be used for culverts and bridge abutments, in their vicinity. The character of the masonry, I have estimated to be of plain, rough, hammer dressed stone work, laid in quick lime mortar. The following esxtimates are made for grading and masonry for a double track -- the first track to be laid immediately, the second track as soon after as requisite. Considering this as one of the links in the great chain of Western Railroads, from Boston to Buffalo and the "far West," the estimates are made on a scale of corresponding character and magnitude to accommodate the business of this great and increasing thoroughfare; and nothing short of a double track will, in my opinion, be adequate for any great period. This is indicated by the fact, that the travel on the Utica and Schenectady Railroad, (which forms another link in this same chain) already requires the second track, to do the business of carrying passengers only; and the fact, that the Tonawanda Railroad, (from Rochester to Batavia) with its present accomodations, having only a single track, is inadequte to the business, although trains of cars run day and night. The subject of wooden superstructure, from its importance, has occupied much attention. From the experience of the present day, there can be no question, that a combination of timber and iron makes, under all circumstances, the preferable road for this climate. The greatest objection to roads of this character, is the large amount of perishable materials used in their construction, as all the different kinds of timber that can be procured in sufficient size and quantities for rails, are not of a durable nature; and from their exposed situation near the surface of the ground they must decay very rapidly. It is found, that in ordinary cases, the common timber of the country will require replacing, on an average, every six or seven years. The following plan for a durable structure, is suggested for your consideration, as a better and cheaper road, than the common modes: The sills to be 4 by 12 inches, well bedded; the top surface four inches below the grade of the road; on the sills are spiked cross-ties of red cedar, three inches thick, of any width not less than 4 inches, and two feet from centre to centre. Between the cross-ties are red cedar blocks, 3 by 6 inches, and one foot long, leaving spaces between the ties and blocks, not exceeding 8 inches. Upon the blocks and ties, and under the rail plates, is a locust ribbon, one inch thick and three inches wide, to raise the iron rail, and clear the flanges of the wheels from the ties. Upon the locust ribbon is placed the rail plate, one inch thick, 2 1/4 inches wide on the bottom, and two inches wide on the top. The spikes to pass through the iron plate, the locust ribbon and the ties, into the sills, confining the whole together. The locust and cedar being durable beyond any experience, may be considered, practically, as permanent as the iron. The sills may be of any timber of the country; being bedded in the earth, and remaining moist and free from the action of the atmosphere they will last for a great length of time. The bearing between the ties and blocks being so small, the plate and ribbon will be abundantly strong for any weight that can at any time be brought upon them. Their spikes being one foot from centre to centre, and passing into the ties and sills, would have an equal or greater hold to keep the rail in its place, than in the common wooden rails. It is believed that the increased size of the rail plate will be materially important in giving stability to the road, and will be more than sufficient to compensate for the large wooden rails, in keeping the road firm and in place. 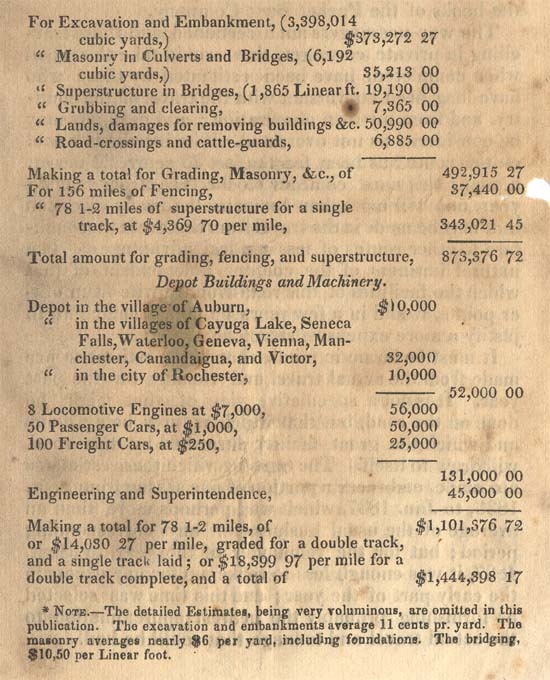 Ten years later in 1848, the cost of the road had amounted to $2,655,520.35 as against his estimate of $1,444,398.17, the total receipts were $454,721.87 for the year 1848 of which only $83,136.85 were from freight as against his estimate of $72,879 from the same source, while passenger revenues were $358,471.30 as against his estimate of $268,638.50. This comparison is not to discredit his estimates which were undoubtedly made with great research and care but to show how little the best of men could forecast the development of traffic at the outset of railroad transportation. And perhaps it is unnecessary to confine the remark to any period of time. Attention is called to the recommendation of Engineer Higham relative to track construction. The novelty in this consists in placing cross ties upon the sills at a distance of two feet from center to center with blocks, the thickness of the ties, resting upon the sills. The ties and these blocks support the rails which consist merely of locust ribbon one inch thick and three inches wide carrying the iron rail one inch thick and two and one-fourth inches wide at the bottom and two inches at the top, and wooden ribbon and iron rail to be securely spiked to the ties and supporting longitudinal sill. It has been impossible to learn whether this precise type of track or that in use upon the roads east was used. At all events the strap rail supported in some manner was used, but its dimensions have not been learned. June 10. A loose bar of the old plate structure entered one of the cars and inflicted flesh wounds on the foot and leg of one of the female passengers. Since acccidents were not required to be reported to the state prior to 1848, and in that year the plate rail was very largely replaced by iron rail on all the roads, we have nothing to confirm or contradict the tradition for the previous years. Occasional criticism has been made upon the location of this road, the critics seeming to think it should have been constructed upon what is now the main line of the New York Central from Rochester to Syracuse which line was in fact constructed in 1851 and 1852. A little attention to the facts of the case in this as in other instances would have been useful. Mistakes in plenty were made in early railroad construction through lack of experience, but this was not a mistake. The country which this road traversed was in the thirties of the last century one of the most fertile and prosperous sections of the state of New York. The inhabitants of the section were greatly desirous of local railroad facilities which had been brought to their attenton by the construction of the Mohawk and Hudson. The feeling for the project was intense in the counties of Monroe, Ontario, Seneca and Cayuga. Between January 8 and March 3, 1835, there was presented to the lower house of hte legislature no less than forty petitions numerously signed by residents of those counties, asking for the incorporation of a company to construct a railroad from Auburn to Rochester by way of Waterloo, Geneva and Canandaigua, and in some of these petitions residents of Wayne county joined. A bill for that purpose was introduced into the Assemby by its railroad committee, February 25th, and it received consideration from time to time until May 5th, when it failed of passage, the vote being 66 ayes and 40 noes, the journal of the Assembly recording, "there not being two-thirds of all the members elected to this House voting in favor thereof." Upon what grounds the opposition was based does not appear. Under this act, $200,000 of the state stock was issued to the treasurer and further account thereof is given in another part of this work dealing with like issues to other roads. The first installment was all sold not later than in September. About December 1st, the second installment of $100,000 was issued, but in a letter of the treasurer dated March 26, 1841, it appears that the state stock could not be sold. The Company was still holding this stock December 27th of the same year; the same situation existed June 25th, 1842. August 13, 1842, the treasurer sent this stock to an Albany bank, asking that it be disposed of to the best advantage in the City of New York. The letter of transmittal advised that it would be necessary for the cashier to go to New York in person to handle the matter and contains the following; "Please call on cashier Withers from whom we have a letter under date of the 8th instant in which he says, 'I believe $100,000 could be worked off at from 82 to 83 and it is possible something better might be done.'" This stock bore interest at the rate of 5 1/2 per cent and that stock of the state of New York bearing interest at this rate could not be sold at more than 82 or 83 more than a year and a half after issuance is a peculiar light on financial conditions at that time. The stock had been hypothecated to the Ontario Bank [Henry B. Gibson, president] as security for loans and the avails of any sale were to be transmitted to that bank. It was actually sold in september, 1842, $50,000 for 82 plus accrued interest from January 1, 1841, to July 1, 1842, $11,000 for 84 1/2; $26,000 for 84; and $13,000 for 83 1/2. How the discount of $17,010 was handled cannot be learned. But little is known regarding the progress of construction work. The road was opened for operation by sections; from Rochester to Canandaigua, September 19, 1840; to Seneca Falls, June 9, 1841; to Cayuga, September 18, 1841; and through to Auburn November 4, 1841. This road having been made the special object of attack by the Buffalo Express it has been promptly vindicated by the Rochester papers. The Express had charged that it was the worst managed road on the line and the mail failures west were mainly attributable to it. 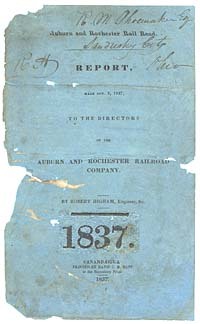 The Rochester Democrat furnishes a table of the time of departure and arrivals of trains between Auburn and that place for 9 days from which it appears that the train has started from Auburn but once at the regular hour and then it arrived at Rochester on time. Twice it left at 15 minutes behind time and arrived in time. In all other cases it has been obliged to wait from 1 to 4 hours for the arrival of the eastern trains. The average time is 5 hours 31 minutes notwithstanding it has been obliged to lose time at meeting places, being, in consequence of the delay, an irregular train. The trains from Rochester to this place (Canandaigua) run with such precision that some of our citizens set their clocks by it and so far from being a badly managed road we doubt if there is a better one in the country. The agents and engineers are not only men of much experience and understand their business perfectly but are also gentlemanly and accomodating to a degree that attracts general attention. This brief article shows that the average time for the 9 days was at the rate of about 14 miles per hour, which as elsewhere shown was about the schedule time for the through express trains. It discloses also the difficulty of fastening the responsibility for unreasonable delays upon the guilty party on a line 300 miles in length operated by eight independent companies. It also shows by the great delays in the arrival of trains at Auburn there was serious fault somewhere east of that point, but where and who was responsible does not appear. Such operation was not a success. How to get rid of it was a problem requiring six more years to solve. The slow running time, as elsewhere shown, was attributable to the character of the wooden track which was inadequate to carry great speed. On January 1, 1842, nine dollars per share was paid to the stockholders as interest on the money paid in by them on calls for stock installments. This is the first instance which has been noted of recognition of the principle of interest during construction, although it is impossible to say it may not have earlier been done by other roads. 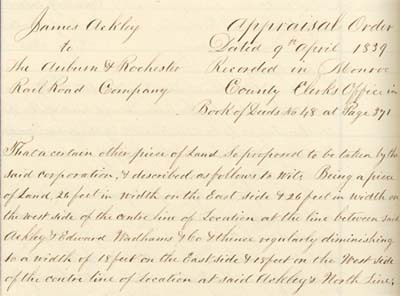 Sir: The undersigned on behalf of the several Rail Road companies between Rochester and Utica desire to present to you for your consideration and co-operation the following suggestions with a view to produce uniformity of arrangement and fare upon the Rail Road line west of Albany. First. That passengers be allowed at the principal office on the line to pay their fare as far as they please. Second. That they be allowed to put their baggage in for such place as they please and that they be furnished with a metal ticket therefor, a duplicate of which shall be attached to the baggage. Third. That arrangement be made for running upon the Rail Road from Albany to Rochester (and ultimately to Buffalo) a daily line of cars of a plain but substantial character, the speed of which shall be slower than the other line and the fare upon which shall be considerably below the rate allowed by the Charters of the respective Companies; or, instead thereof, that a uniform rate of through fare be adopted that shall be as near 3 cents a mile as is consistent with ordinary currency. In regard to the first two suggestions we are of opinion that if adopted they will add to the convenience of travelers and will save the Companies much trouble and responsibility as to baggage. The last proposition is made to bring the matter up for discussion, without tenacity on our part, but under the impression that sound policy requires the Directors of the several Rail Road Companies deliberately to consider it. An arrangement was consummated to sell through tickets from Rochester to Albany and such sale commenced July 22, 1842. The Auburn and Rochester received for its part $3 for the 78 miles of its road first class, and 87 1/2 cents for second class. A letter of the secretary dated June 6, 1842, shows that the Board of Directors had fixed salaries as follows: engineer and superintendent, $3,000 per annun; monthly salaries, receiver at Rochester $50, at Auburn $25; traveling collectors $50 (which term is used for conductors); general clerk at Canandaigua $50; freight agent $40; baggage men $25; locomotive engineers, per day, $2, except one who was given $2.25. 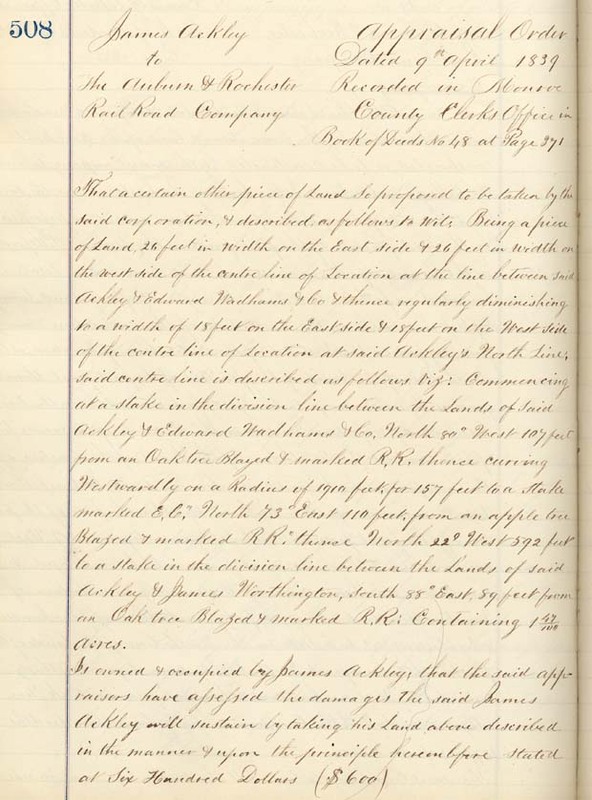 Another letter dated June 13, 1842, to Robert Higham, the superintendent, shows that Pomeroy & Co. were carrying on an express business over the road but the full terms of the arrangement with them have not been ascertained. Part of them are shown in the letter, "We have agreed with Pomeroy & Co. that their express men shall be allowed to take and carry with them over our road at their risk, free of charge, two trunks not to exceed 3 feet by 18 inches and two boxes of specie not to contain over $1,000 each; or three trunks of the above size and no specie: in case of excess for the whole distance or for part of the way only to be charged for the excess to specie say at the rate of one seat for every 4 boxes of $1,000 each; for trunks, etc. the same as you would charge any other person." In August the salary of the receiver at Rochester was increased to $800 per annum in consideration of his increased labors due to the sale of through tickets to Albany, and in the same month second class fare was increased from 87 1/2 cents to $1.50. Our President, Mr. Gibson, says he is about as sick of co-partnership as you would seem to be by the unceremonious manner in which you discontinued our recent connection for running our cars to Syracuse. He adds that if you had called and stated the difficulties or objections you had to continuing the arrangement they would have in all probability been obviated by us, but as it is we will hereafter do businees on our own hook and leave you to the enjoyment of the same course, or any other you may deem expedient to adopt. It seems that the Auburn and Syracuse had adopted a rule to deliver no freight to the Auburn and Rochester until its charges were paid. This, of course, made a rift in the harmonious feeling and the same day Mr. Seymour sent the foregoing letter to Mr. How, he sent another to Higham, his superintendent, directing him to pay all such charges on delivery of the freight and that thereafter no freight be delivered to the Auburn and Syracuse, "until our charges and the advances we have made are paid in full and that in no instance must this rule be departed from." What the outcome of these friendly interchanges was has not been learned. Doubtless the feeling engendered was softened by time and negotiation and harmonious operating relations again prevailed.